During the Great War members of the Salvation Army were busy supporting service men and women, their families and the general public across the UK and in the war zone. They set up accommodation for soldiers and sailors so that wherever they were they could always find a safe place to sleep when travelling between postings or trying to get home on their leave. It was not uncommon for service men to become lost in the larger cities or to miss train connections. They organised for parcels and letters to be sent to the front. The contents of the parcels could range between chocolate to much needed socks. Sewing and knitting circles were organised to provide these small necessities and luxuries. The Army were prestigious fundraisers. They raised money to purchase the very first motorised ambulances to replace the horse-drawn carts which were being used. 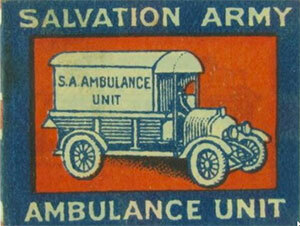 Salvation Army men also were ambulance drivers, many of whom were bandsmen who would entertain the troops. They set up public food kitchens to help feed families and to provide sustenance in times of emergency. Members of Salvation Army visited homes of service men and offered support where needed. Soldiers were contacted to reassure them that all was well at home. Salvation Army huts were created wherever the Army was stationed, at home and abroad. These provided places where service men could relax, read, write letters and enjoy tea, cake and hot food during any free-time. They did not shy away from where the fighting was occurring. Field kitchens were set up close to the trenches – usually run by women. When rations were low the ladies would make doughnuts earning themselves the nick-name of “doughnut lassies’! The Salvationists also visited the wounded in hospitals with small gifts and offering to help with contacting their families. They also help tend the war graves, writing to the families explaining where their loved one was buried or remembered. Chaplains could be from the Salvation Army. As well as holding religious services and offering emotional support and a friendly ear they also offered practical help such as preparing vegetables. We must not forget the part also played by the American, Australian and New Zealand Salvation Armies in this humanitarian work.